This is the decisive set! Your OpenGL version is too old. 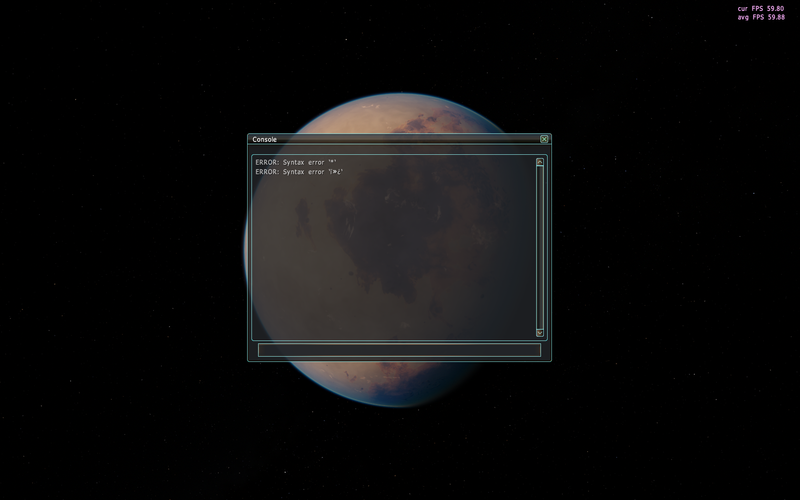 SpaceEngine can not work with these obsolete version! Perhaps an update of the graphics card driver may help. Perhaps! But, I'm afraid you're out of luck. The latest driver for your graphics card. I could find - is from 2010. 'Catalyst 10.2'. And those are only for Windows XP and Windows Vista. And I'm not sure if the driver really works with your card! how this openGL can be updated? Hi ive been having problems with locking my ship into orbit around a object. For some reason i do not have the mode button on my Ships HUD. Ive tried looking for solutions but i cant seem to find the reason why this is happening. PLZ HELP Also i put a picture of the ship HUD. Hi, guys. I have these two odd errors in console. Any ideas what they mean? post the log file. This is the file 'se.log' in 'SpaceEngine\system' folder. In this file you can see which scripts are causing this errors. Thanks a lot, Jack, the problem is solved. Just forgot to remove /* from my modded catalog file. It didn't seem to cause any in-game issues but I hate seeing errors in my console. No idea if this is a bug, I may have found a system that was duplicated almost exactly the same and placed only ~1200AU away. I tried searching for the star(s) online but couldn't find any results for any of the three designations HIP 26690, HIP 26692 or HD 37603 so I have no way of knowing which is the real star. Not sure if this has come about as an error in-game or if the developer accidentally added the same data for a different star, but either way just a cool surprise. the stars are both 'real'. They are, seen from Earth, only very close together. However, the distance is not entirely correct. 'HIP 26692' must be much farther away. 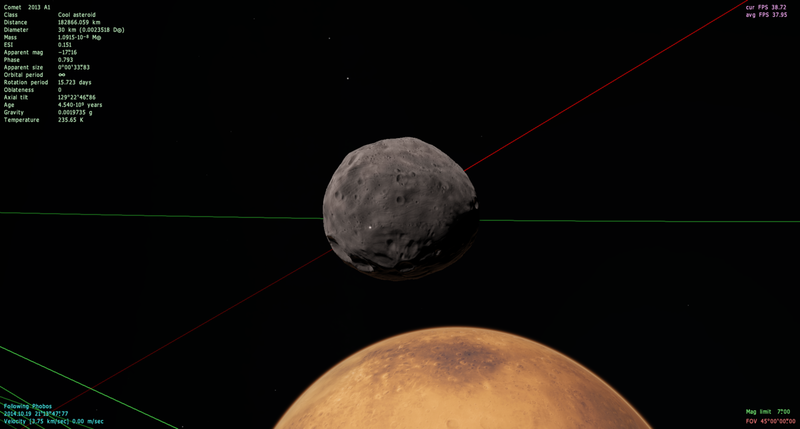 Because the stars are in SpaceEngine at nearly the same coordinates and also have the same star class, SpaceEngine produced naturally for both star a nearly identical system. If you have SE 0.980, put the attached file in 'SpaceEngine\addon\catalogs\stars'. If these folders do not exist, you have to create them. // Put in the 'addons\catalogs\stars' folder. It corrects the distance. Then you have two different systems. Is this now called the Main-Def.cfg file? I have a 1080 GPU, can I really set this up to 8192? Will that improve the game in other ways? It is now the 'main-user.cfg'. The 'main-def.cfg' is the file with the default settings and should not be changed. Your own settings you can make in the 'main-user.cfg'. Thanks. Can I really set it to 8192? Or even 16384 if I include my system RAM? Would that even make a difference? Thanks. Can I really set it to 8192? You can, but it didn't make any benefit. SE will be RAM-limited, so VRAM usage will not be more than 2-4 Gb. Anyway, SE doesn't need so many memory for now. Or even 16384 if I include my system RAM? Would that even make a difference? You can't "include system RAM". Video RAM and system RAM are physically different hardware, and have different purpose. They cannot replace each other.